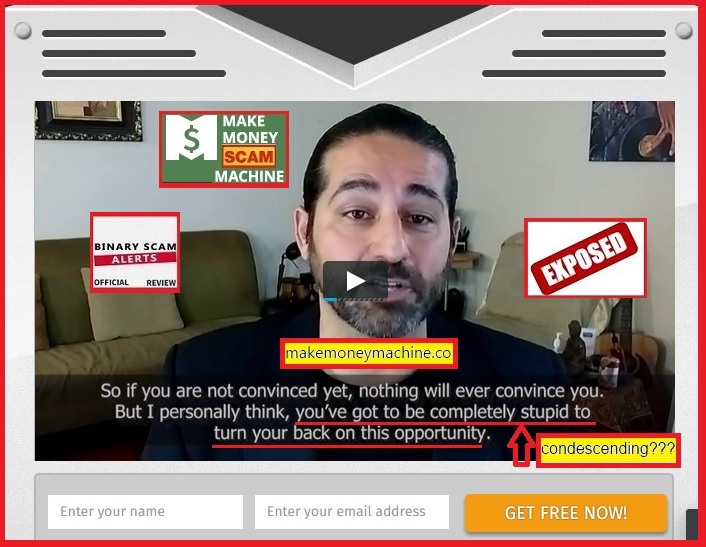 Binary Scam Alerts is posting an immediate SCAM and BLACKLIST notification in regards to the Make Money Machine Software, Auto-trader, and APP as well as Peter Collins (who ever that is). This time we didn’t receive SPAM Emails, but we did get complaints about very aggressive pop-ups, so this got us very agitated and we decided to conduct a full scale investigation and review into this so-called system. 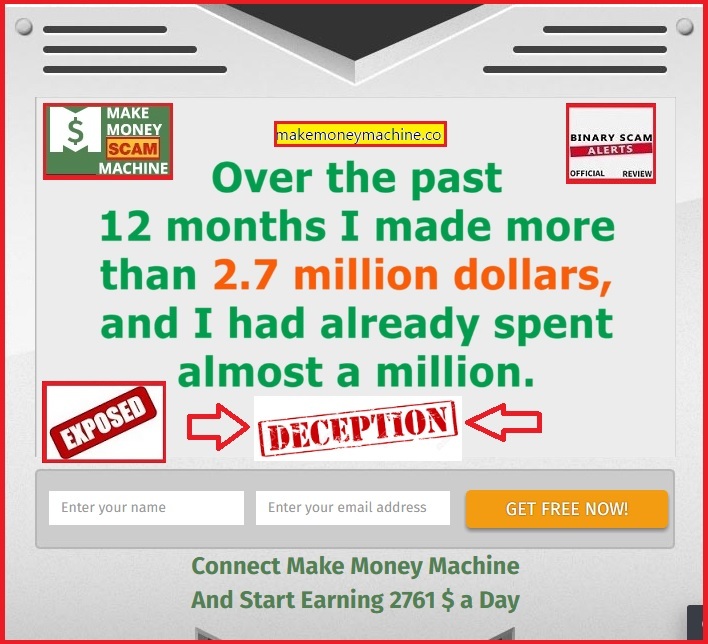 The popup we received indicated we would have free access to a trading machine that would generate profits for us on auto-pilot. Naturally we tested this software and unfortunately risked $250 just to see how it worked. We have to admit the dashboard is quite impressive, but the results were far from it with an ITM ratio of 40%. As a result we decided to expose this system since it is obviously rigged and a confirmed binary options investment scam. Below you will see a statement about how someone made “more than 2.7 Million Dollars” over a period of 12 months, and apparently they spent most of it. I don’t really care for statements having to do with inflated bank accounts and superb performance from anonymous characters. There is no face here or someone who can validate these claims. I don’t see a legal business entity with a physical address and phone number since we are most likely dealing with a rogue outfit from somewhere in the Ukraine, the Balkans, or the Middle East. Additionally, this is not a savvy marketing group, and I suspect its just a collection of programmers that wanted their own little cash cow where they could scam day-traders but don’t really understand how to relay information. For example, the actor below is saying “you’ve got to be completely stupid to turn your back on this opportunity.” This is not something that would resonate well in North American or West European crowds, and I would say it’s very condescending and rude which validates my previous insights about who these people are and how they choose to operate. It’s really sad but the people spewing lies and misleading the public are actually paid actors who will swear on their eyes they are direct decedents of King Henry VIII if the price is right. The images are too theatrical to be real, and are most likely images stolen from the internet without written consent or permission from the owners. Here we have the same kind of narrative which is a recurring theme with all the trashy apps. Mr. Peter Collins (whoever that really is) is promising you $2,761 a day on auto pilot. The image above illustrates something which can only be found in fairy tales or bad jokes. We are talking about an ITM Ratio which is over 97%, and if this was true than there would be a substantially higher amount of millionaires in our little world since everyone would flock to get this app especially since it is free! In reality this is a ruse and a complete fabrication. As mentioned previously, the user interface for the auto-trader is quite impressive and if looks would be sufficient these guys would be my new best friends. However, accuracy and graphic presentation are completely different things and we are only interested in results as opposed to window dressing. Not really, it will cost you a minimum of $250 to get started and it will be paid through one of their recommended brokers which may or may not be regulated or honest. These include but are not restricted to: Disrupt Trading, Cloud Trader, Quick Cash System, Binary Matrix Pro, Millionaire Blueprint, Profits Infinity, The Free Money System with Walter Green, The Azure Method, Lie Detector Millionaire, Regal Wealth, Google Trader, and the Push Money App with Dennis Moreland. Do yourself a favor and stay away from fake apps. Check out our recommended section for the best selection of systems the industry has to offer. 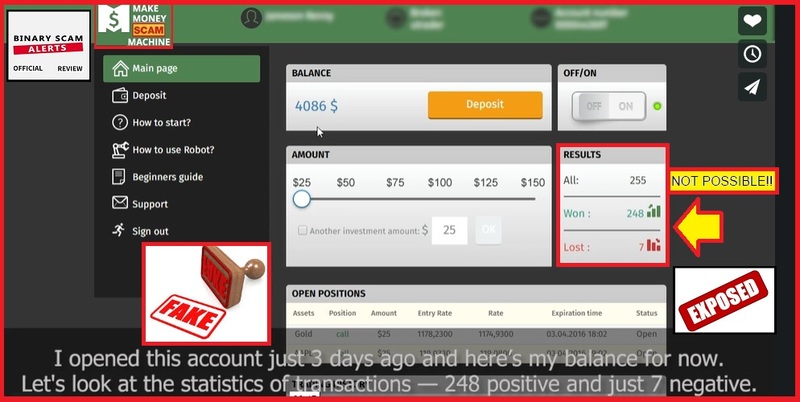 The Make Money Machine Software, Auto-trader, and APP as well as Peter Collins is a verified binary options investment SCAM. This review has provided indisputable proof and there is not one single thing here which is genuine, legit, honest, or sincere about this system, and in fact the exact opposite is true. It is extremely misleading and deceptive, so we are warning all our members and viewers to use extreme caution if being illegally solicited to use this app and report them on our website immediately. Our real discussions are done daily in our Facebook Group and subscribing to our YouTube Channel will help you get more fact and information about legit trading tools.